The Extra Component, or Added Value, which makes it a tremendous experience! Over the last couple of years, our players have had the opportunity to have some pretty awesome experiences as a team. Whether it’s eating pizza for dinner overlooking the battlefield at Gettysburg, taking in the sites and folding a replica of the first United States flag at Fort McHenry, taking in a DU vs. BC hockey game, visiting Monticello, driving through the Garden of the Gods, having a campus tour, or checking out the UNC Basketball Museum, we do our best to include a cultural component on every trip. Of course, this does largely depend on our competition schedule. When you play in a tournament at Gettysburg, making it to the battlefield and getting into the historical relevance is pretty easy. The entire town screams patriotism. We had the opportunity to actually play during the 150th Anniversary while cannon fire was going off in the background. It was unbelievably loud! Once we completed playing in the tourney, we made sure to visit the Texas State monument to take a picture. An absolutely amazing place! The Gettysburg Texas Monument on the 150th Anniversary. While Gettysburg has to be tops in terms of settings that appeal to our sense of patriotism, we have had the opportunity to check out two other spots that are right up there - Fort McHenry and Monticello. We visited Fort McHenry when we traveled through Baltimore and Monticello when we played at UVA. 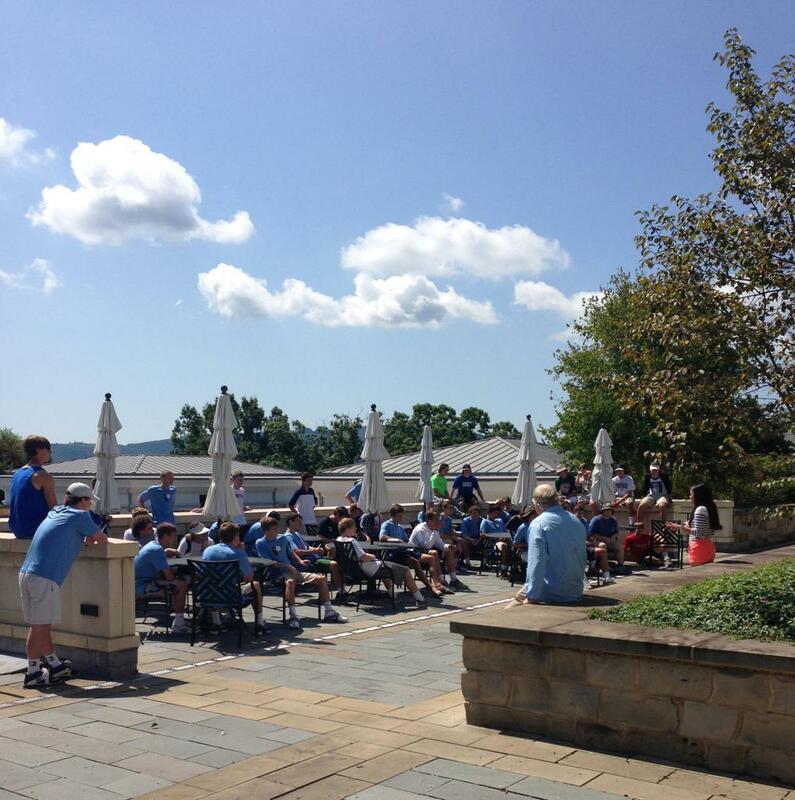 These two places are steeped in history, and our players really enjoyed appreciated both historical locations. Folding the Flag at Fort McHenry. On our recent trip to Colorado Springs for the Adrenaline Shootout, we had the opportunity to drive around an unbelievable, natural monument. We took in the Garden of the Gods, a true sight to behold! We took the bus because it was really warm (even by Texas standards) and the kids were exhausted after playing a full slate. Still, it was pretty awesome! While all of the historical locations have their allure, the DU vs. BC hockey game was absolutely incredible. During our trip to the Denver Fall Team Camp, we just happened to be there at the exact right time and took the entire squad there on the spur of the moment. For anyone that does not know, DU and BC are at the top of the heap in terms of D1 Hockey. The game went to a shootout and DU won! What a great experience! DU vs. BC @ Denver. We have stayed at a lot of college campuses and taken in much of what they have to offer. (We always opt to "stay on campus" when the opportunity presents itself.) At UVA, our players went on the college tour. It's a pretty remarkable academic institution, and our tour guide did a great job. At UNC, we have visited the UNC Hoops Museum where you can see all kinds of awesome historical pieces from the storied Tar Heel program including the letter from Duke to Jordan. They missed out on that one. Finally, at Notre Dame (yes, we used to go there on a yearly basis), we have toured the Stadium and taken pictures down the tunnel that the football team comes out of. We've seen the Heismans and seen the campus. We make sure our players see as much as possible as we truly believe that there is much more to having a well-rounded experience than just playing the game. On campus means getting instruction from some of the best. Here is our group with the legend, Dom Starsia. In the coming days, we will release more content that comprises the subsets to the overall, StickStar Experience article. This content will always be found under the Select Programs but will be released in Articles first. We hope you enjoy getting to know our program a little bit better! 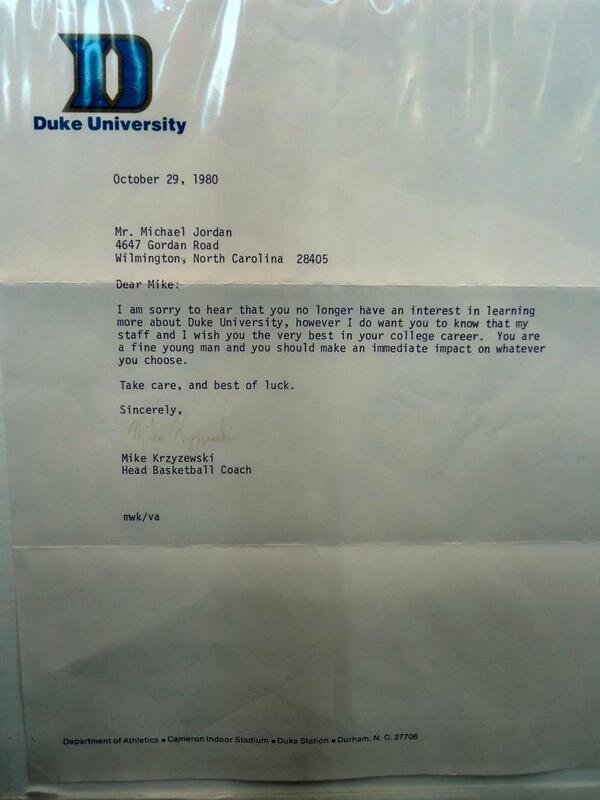 Letter from Krzyzewski to Jordan.